Jewels finished her AKC Championship from the Bred By Exhibitor Class. With singles already under her belt, she took four consecutive majors at Las Vegas, Nevada shows to finish her championship. 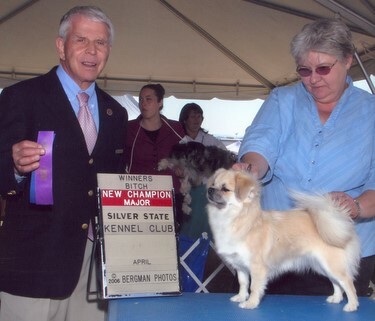 Thanks to the photography of "Aunt" Jolyn Owen and Ryan, we have photos of Jewels' first dog show. Jewels spent most of her time ringside in Jolyn's lap or in a chair sitting on top of Jolyn's hat. 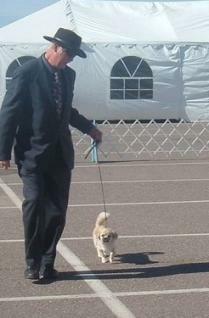 Jewels took time out from visiting her "Aunt" Jolyn to gait around the show ring with Robert. From the time she was a tiny baby, you could see the inquisitiveness and mischief in Jewels' eyes. She was just one cute puppy! 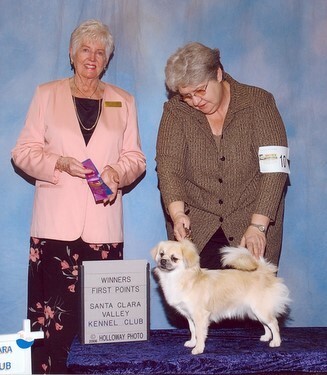 She was Sarai's first AKC Champion. 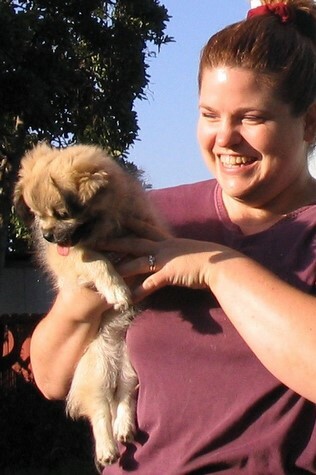 Jewels was Sarai's first puppy -- a singleton litter. Because her dam's name in Hebrew implies that she is a princess, we felt we should name Sarai's first puppy something equivalent. Rinchen is Tibetan and means "precious" while "norbu" in Tibetan is a jewel; hence, "Jewels" as a call name.